Last week, I decided to redecorate our master bedroom for summer. This was mostly due to the fact that I desperately need to get the dining room molding finished and I was looking for an excuse not to work on it. Michael Hyatt calls this the “Resistance.” I like to call it good, old-fashioned procrastination. As I was exercising my decorating mojo, I thought it might be a good opportunity to share with you some of my top tips for decorating the master bedroom. 1. Do switch out your bedding set seasonally. I change out the art and accessories seasonally, too. This is why I tend to stick with neutral paint colors for my walls. It offers more versatility when I want to redecorate a room. My bedroom wall color is Valspar’s Smoky Pitch 4007-4B from Lowe’s. 2. Do mix and match master bedroom furniture pieces. They share a common accessory. Each of my nightstands has the same lamp, which creates cohesion. Their heights are similar. My vintage piece is actually about six inches shorter than the other nightstand, so I use a stack of books to make the lamps the same height, which connects the pieces. In other words, don’t worry if your pieces aren’t exactly the same height. Just plan to accessorize them so the vignettes as a whole end up looking that way. 3. Don’t hang artwork that is larger than the furniture beneath it. The artwork I’ve hung over my nightstand is slightly wider than the nightstand below it, which is a big no-no. (Hey, you use what you’ve got, right?) 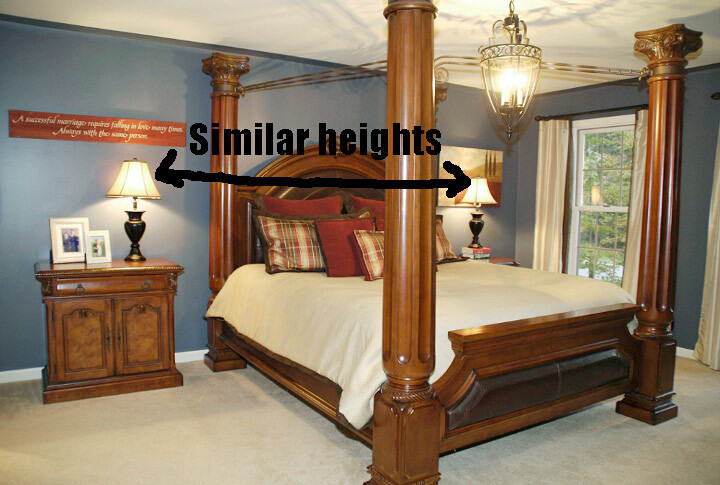 This creates disproportion and makes the artwork look too “heavy” for the room. I recommend using pieces that are 20-30 percent narrower than the furniture below them. This allows the furniture to properly “ground” the artwork. This is also a good rule of thumb to follow when hanging flat-screen TVs or items above a fireplace mantel. 4. Do create vignettes using odd-numbered groupings. 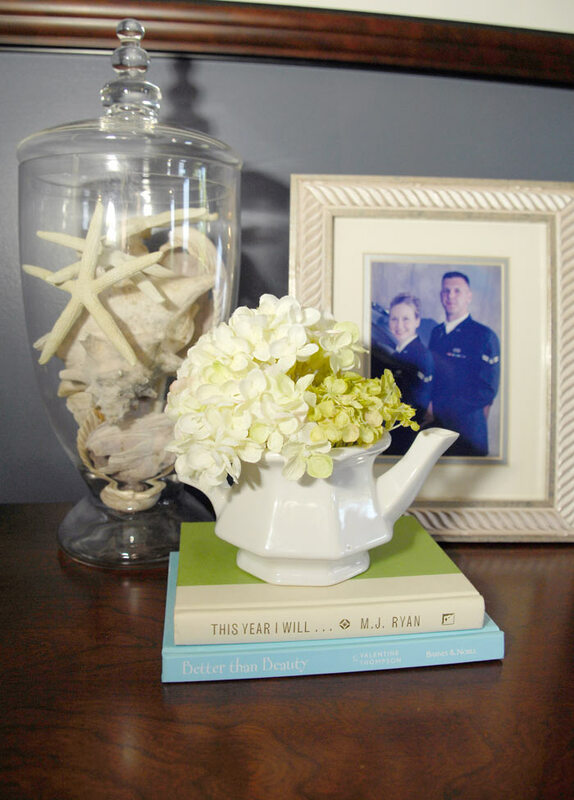 The vignette above is made up of a collection of three elements: the shells/starfish, the books/teapot and the framed photo. This grouping varies in height and texture, which helps to “fill in” the spaces between the objects. Refrain from displaying objects in a straight line or with the same height and width, which creates a “target practice” look. For more information on why odd-numbered groupings work, read this article. 5. Don’t display pictures of your kids in the master bedroom. But considering they also consume about 90 percent of my life, it’s nice to have a kid-free zone in my house where I can escape relax and remember I’m not just a mom. In my master bedroom, you will only find photos of me and the hubs. 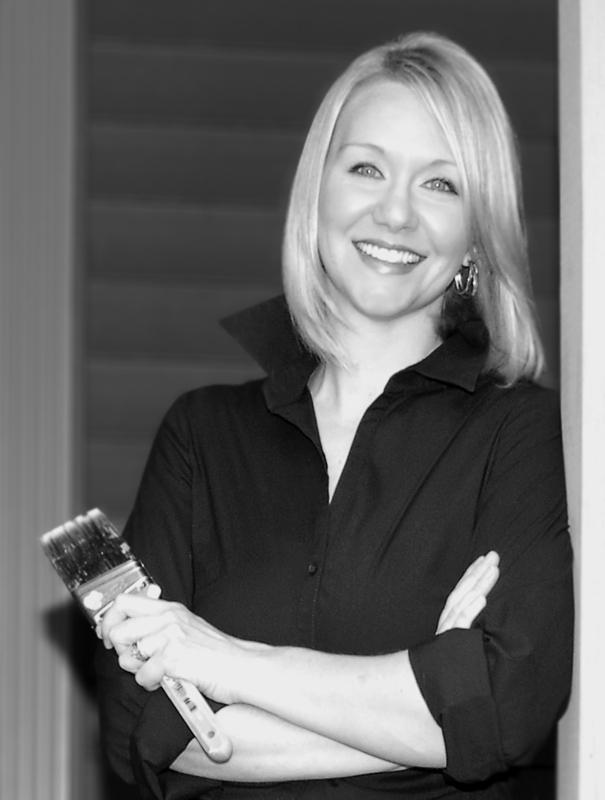 So that wraps up a few of my master bedroom decorating dos and don’ts. Do you have any of your own? Please consider leaving a comment and sharing. I’m linking this up to: The Shabby Creek Cottage, House of Hepworths, Easy Living Mom, Saving 4 Six, A Glimpse Inside and House of Rose. 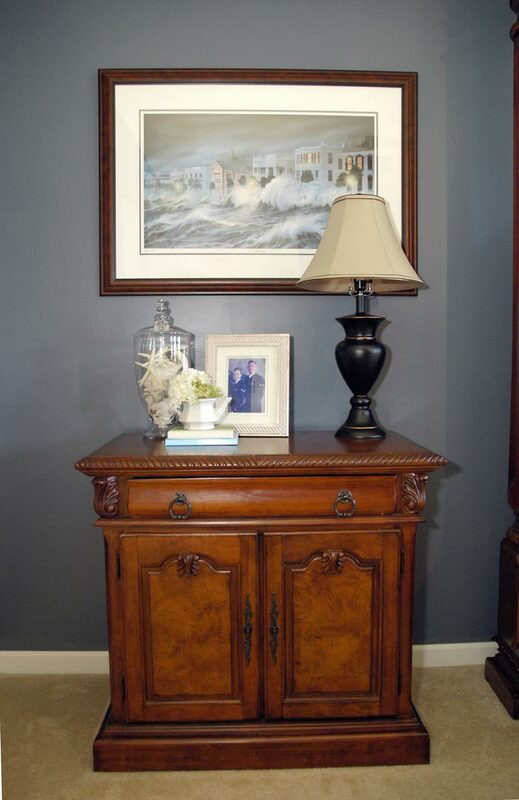 This entry was posted in Bedrooms, Decorating, How to, Seasonal by Susan. Bookmark the permalink. I’ve been working on our master bedroom, too! We also have a neutral palate with the wall color, and this permits more splashes of color with throws, pillows, and accent pieces. After years of having just shades (and no neighbors), I finally hung up real curtains this week. I hadn’t thought the the room had looked unfinished without them, but it sure does look more finished with them. Noticable improvement! We have the exact same bed, but our nightstands that came with are a bit different. I loved the furniture in the store, but fell into the trap of not measuring before we purchased. I didn’t realize how big these pieces of furniture were until they were delivered. Thank goodness we have a nice sized master bedroom or we would have been in trouble. We did the same thing. This set is gi-normous! It’s all matchy matchy. Maybe I could disperse the night stands into other rooms of the house and get different pieces for our MB. Great tips, and a reminder to me that it’s time to flip my quilt over to the reversible side for a different look this summer! 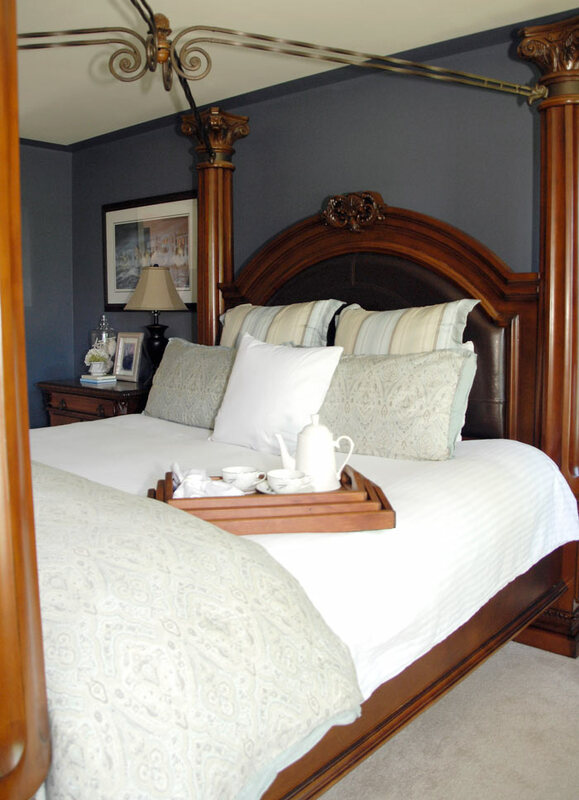 Great tips on decorating the Master Bedroom. I could not agree more about the…no pictures of your kids. So true! Thanks for linking up at Think Tank Thursday. I have featured you this week. Great tips! We have zero kid photos in our room too. I think it definitely helps to make it a quiet relaxing space for me and hubby. Thanks for posting! I have mismatched bedroom furniture right now but this is too mismatched. We are getting ready to look and purchase new bedroom furniture. I’m glad I ran across this article before I purchase. This really gives me something to think about as we search. Also, I love the idea about the kids’ pictures. My husband wants them displayed everywhere. I took all of the pictures of them down and out of our bedroom about 5 months ago. 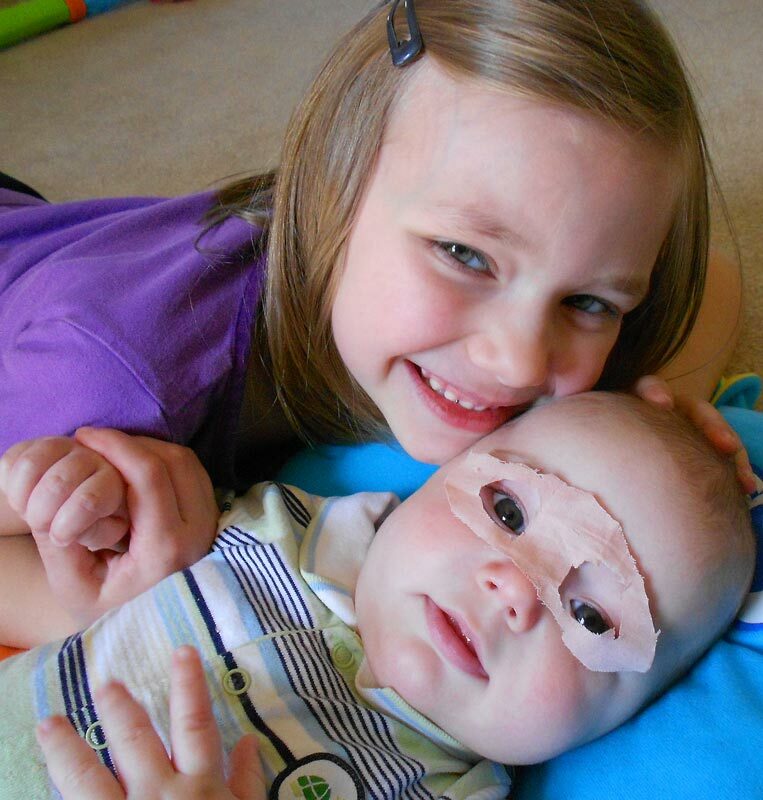 I can hardly wait to show him this article when he returns this afternoon after work. Thank you for all of the great tips. And by the way, our kiddos are 32, 29, and 24. To me, the pictures of these little children was just a reminder of how old we are and my bedroom needs to be my safe haven, peaceful and restful with no reminders causing anxiety. Thank you so mug for your very helpful tips! I am in the process of redecorating my daughters bedroom and didn’t know what to do about her mismatched nightstands.One is vintage and is about 6″ taller than the other one. The pieces are similar in design and I was considering cutting off the legs. Your idea of placing something underneath one of the lamps to make it visually cohesive was something I had not even thought about! Love that idea!!! You’re welcome, Kym. Glad the info. was helpful! I love these ideas. Where did you buy your comforter (light green in first picture) from? Love it! Thanks for stopping by, Crystal. I got that comforter set from JCPenney awhile back. It was from the Cindy Crawford collection. I don’t believe they still sell it at JCPenney, but you may have some success finding it elsewhere online. Absolutely! But if you want to keep the room from looking a little too flea market/thrift store mish-mash, you’ll want to remember to tie the pieces together. 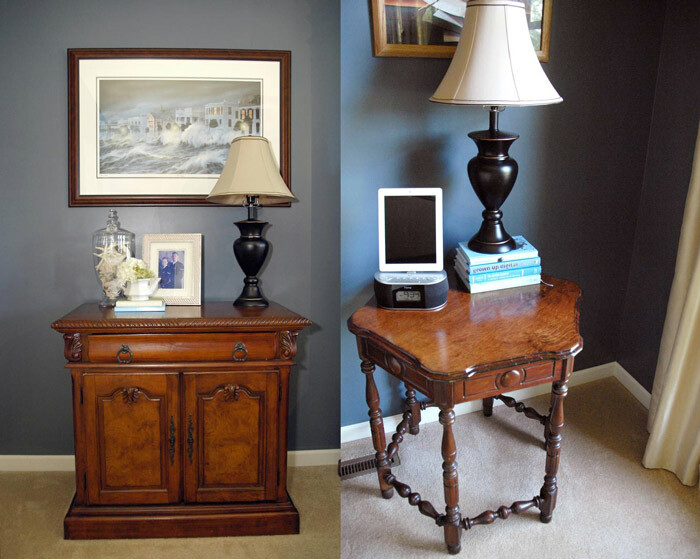 Here are a few articles with some tips on how to do this and mix and match furniture successfully: http://www.houzz.com/ideabooks/34878/list/Mix-a-lot–10-Ways-To-Pull-off-Mixed-Furniture; http://www.houzz.com/photos/bedroom/mixing-furniture-styles-; http://theinspiredroom.net/2013/05/20/mix-match-dark-wood-furniture-cottage-style/. Best of luck with your decorating project, Megan. And thanks for stopping by. This article was great! I’m moving into a new home and anticipating new furnishings I’d like the master to appear peaceful and serene. It’s about 525 sq. ft. and I’d like to incorporate a sitting/reading area into it. It’s approximately 2 blocks from the lake. Any ideas? great article! We moved recently. I’ve always loved decorating, and I’d like to think I’m pretty good at it. It’s nice to know that I’m on the right track. I’m working on a comfortable and romantic master bedroom. Not a kid pic in sight. I’m doing a music theme since we are both obsessed with music, and nothing too girly or frilly (I don’t like that stuff anyway). My better half appreciates that and seems more interested in the decorating process since his interests and tastes are represented as well. Thanks for the tips. I have question. I inherited dresser is somewhat different look than highboy and has silver pull vs gold. Should I buy new pulls for each piece or find similar ones for highboy. I didn’t want to retain under pull for fear it wouldn’t match as from factory. Finding similar ones for the highboy seems like the easiest and most economical solution. no pics of kids? i disagree! i would plaster my kids pics everywhere if i could! i never need a break from seeing them. I agree. I have 3 large portraits of me with each of my three children when they were babies, that I have on the wall in the sitting area of my bedroom. The room is separate from the bedroom by a large arch. I feel the portraits are too personal to put anywhere else in the home. They give me no anxiety, or remind me of how old I am (my children are 18, 23 and 26) but they remind me of how sweet my children were and how I adored them as babies. one of my master bedroom rules in no TV in the room . It needs to be quiet and serene. we had one for years and now I wont have one in there . I don’t let my kids have them either . Love your article and all your great ideas , very helpful to me . Sauder has nightstands in a similar finish for pretty cheap (http://www.sauder.com/Home.aspx). Or you could try your hand at a DIY project, such as refinishing a thrift store nightstand to match or staining unfinished crates and using those as nightstands. Also, anything with a metal patina that matches the dresser’s hardware should work well. Best of luck decorating your space … and great choice on the dresser! I was a young wife and mother at age 17. We started our married life out with my husbands waterbed and not much else. I couldn’t wait till the day I had a whole matching bedroom set. So exciting. The bed, dresser w mirror, armoire, free standing mirror, 2 matching nightstands. It was a triumphant day indeed. And then we moved into our newly build dream house. Don’t get me wrong. It was beautiful but after a time I realized it looked more like a showroom than our room. We now have mixed and matched pieces. Many inherited pieces and, well, we have been together 31 yrs now and it shows in every room. We have hit all your do’s and don’ts without even trying. It’s a really good list and I love my bedroom. It is our sanctuary. I also change my bedding, curtains and artwork according to the seasons. Really its a good list for the perfect bedroom! I just purchased an Iron bed that is sort of gun metal in color. I have cherry night stands and would like to paint my dresser. What color would you suggest I paint the dresser? I’d probably choose a beautiful linen white color to give some good contract to the dark bed frame. Best of luck with your project. I’m looking to create a reading area in my master bedroom and I’m having difficulty finding a nice chair and ideas. Any suggestions please. Wayfair and Overstock have tons of options for side chairs and accent chairs. I also like to peruse HomeGoods and TJ Maxx and Hobby Lobby to check out the selections at those stores. The key is to make sure you don’t purchase a piece that is too large.